Effusive (приток лавы) и мягко взрывчатых веществ (Стромболианская) вулканов. Встречи на высшем уровне и частые Пашина извержений, последний похоже происходящие в кластерах, длится несколько десятков лет. The New SE crater has calmed down. Only very occasionally, a weak glow appeared from the summit vent at night, suggesting deep-seated activity still occurs from time to time. Although the paroxysmal phase of the eruption ended at night, tremor has remained elevated and strombolian explosions continue to occur from the summit vent of the NSEC. Tremor continues to decrease slowly after it had reached an impressive peak. The New SE crater continues to produce intermittent fountains and impressive lava bubble explosions and the lava flows continue to advance to the south and SE. At the peak of the paroxysm, a lava flow starts to flow out from the saddle vent and forms a delta south of the SE crater complex advancing towards the camera's viewpoint, with two branches (to the S-SW and SE), similar as during the past paroxysms. The eruption continues to increase and there are now at least 2 vents producing lava fountains. The eruption is still increasing; intermittent views from the webcam show strong lava fountains. 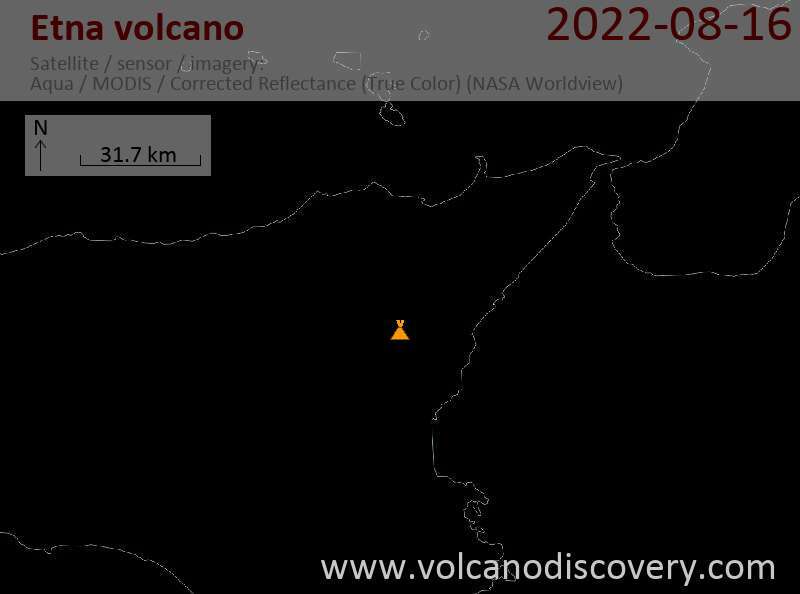 The ongoing (and still increasing) eruption of the New SE crater has forced the closure of the airspace around and the airport of Catania itself. The eruption is still increasing and probably approaching its peak intensity now. The 18th paroxysm is in full swing. From the webcam SW from Monte Frumento Supino, lava fountains can be seen rising from the New SE crater. The tremor amplitude has started to rise quickly, which could be the beginning of a new paroxysm. Thick cloud cover prevent direct observations to check whether there is strombolian activity at the New SE crater at the moment. In the second half of the night, the glow from the summit vent of the New SE crater became more intense and frequent. Tremor has remained low. No significant changes have occurred. The New SE crater remains restless with some occasional weak activity, visible from time to time as faint glow on the webcam at night. Tremor is currently low. No changes in activity have occurred since yesterday. Very occasionally, glow from the summit vent at the NSEC and from a vent at its southern base is visible, suggesting ongoing sporadic deep-seated explosions inside the cone. Tremor is low at the moment. The New SE crater is restless. Occasional glow from the summit vent suggest that deep-seated strombolian activity continues. At the same time when this activity was visible, a glowing spot at the southern base was present as well. This could be a small effusive vent that is activated briefly during phases the magma column rises high enough inside the conduit. Also today, the volcano produces nice steam rings. Tremor is currently low. The 17th paroxysm has already ended. It was much faster and weaker than the previous ones and the intense phase of lava fountains and emission of a tall ash plume lasted only about one hour. Time-lapse video of the eruption this morning. Etna continues to produce beautiful steam rings. The latest paroxysm (number 17 in 2013) at the New SE crater started this morning. Strombolian explosions increased quickly and are now merging into lava fountains. The tremor is steeply rising. You can follow the activity live at webcams.volcanodiscovery.com (or if you are on a small mobile display, at the mobile optimized version). The New SE crater is not completely quiet: there are small strombolian explosions, sometimes with lava ejections and sometimes only indicated by occasional weak glow from both the summit vent. In addition, at the same time increased glow is visible at the effusive vent on the east side of the cone. The latter has shown a similar behavior for the past two weeks before and after the main phases of the eruption. It seems to become active whenever the internal pressure in the conduit increases during explosions, and reacts by squeezing out small amounts of lava. The New SE crater has remained calm, although tremor is still slightly elevated and shows a weak rising tendency. Will the volcano maintain its "habit" to produce another show over the weekend? Weak explosive (sporadic small strombolian eruptions) and effusive activity (weakly alimented lava flow from eastern fissure vent) continues at a decreasing trend. There are interesting small surges of activity at rhythmic intervals of 3-4 hours (visible as the smaller peaks in the tremor signal). Activity has gradually decreased since the last paroxysm, with short peaks of renewed stronger activity in between. As of now, weak explosions probably still continue at the New SE crater but cannot be observed due to cloud cover. Tremor signal is still elevated but with a an overall decreasing tendency. Eruptions continue. Bright lava explosions occur at the New SE cone and tremor levels remain high. The tremor signal has started to rise again and the explosions that continued at the New SE crater have become bigger as well. Is a "follow-up" paroxysm in the making? As expected, the 16th (in 2013) paroxysmal eruption took place at the New SE crater over night. The main phase lasted about 5 hours between midnight and shortly before dawn. It consisted of violent pulsating lava fountains reaching 300-600 m height, thundering explosions of giant magma bubbles that ejected large glowing, liquid spatter to hundreds of meters distance in radial directions, and the effusion of several lava flows. The first lava flow was erupted from the fissure vent between the old and new SE crater and traveled to the south as far as the former Torre del Filosofo area, on top of the much larger flow from last week (11 Nov). A second flow was active from the eastern fissure of the cone, traveled east and bent NE at the 2008 vents and a few 100 m or so into Valle del Bove. The third flow was erupted to the NE towards the Valle del Leone, similar as during the previous paroxysm. In comparison, lava flow output was much less than during the past eruptive phase 6 days ago. The New SE crater continued to produce frequent strombolian explosions in the morning afterwards, again, in much the same way as at the end of the previous paroxysm. Intense strombolian activity is occurring at the New SE crater. Tremor has been climbing slowly, and it seems more and more likely that the next paroxysm is about to start in a near future. Weak explosions continue at the New SE crater, and often produce steam rings. This morning, tremor has started to rise, which could indicate the start of yet another paroxysm. Explosions continue at the New SE crater. The weather is mostly bad and visibility is limited, but the glow seen on the webcams speaks for itself. Tremor continues to climb slowly. Are we in for another paroxysm soon? Activity at the New SE crater has decreased during the night, but probably weak strombolian explosions still occur from time to time. At the moment, weather is very bad and visible observations difficult. The tremor decreased as well, but has gained again and continues to show an overall increasing trend, similar to the days before the 10-11 Nov paroxysm. Weak explosive activity has resumed yesterday evening (or, more likely, continued from 11 Nov) at the New SE crater. Weather conditions are currently very bad, but the webcams occasionally show this activity. Tremor has picked up a bit, suggesting that another paroxysm could occur in a near future. The latest paroxysm has greatly enlarged the field of young lava flows south of the SE cone, including the upper sections of the access road. Unfortunately, the Torre del Filosofo seismic station (ETFI) of INGV was buried under lava from the 10-11 Nov paroxysm and several other monitoring stations might face a similar fate if similar eruptions continue to occur. Strombolian activity at the NSEC ceased during the night, and the lava flows from the last paroxysm are no longer active today. Tremor has returned to low levels. Intense strombolian activity continues at the New SE crater. When observed this afternoon and evening, mild to strong explosions have occurred at intervals of few seconds to minutes. Sometimes, they could be described as spattering, while at other times, large and noisy detonations caused by large bursting bubbles sent glowing lava bombs into circular paths several hundreds meters height and distance. An effusive vent remains weakly active at the upper eastern flank of the cone. The awaited new paroxysm of Etna's NEW SE crater started last night and is still in full progress. Unfortunately, a snow storm above the summit area prevents detailed observations, but judging from the seismic signal, this eruption is unusually long and intense (and still growing at the time of updating). Ash fall has been reported from villages to the E/NE (Zafferana, Milo etc), where the plume is carried to by strong Libeccio winds. The newest paroxysm at the NSEC seems to have started. Tremor rises sharply and explosions are becoming nearly continuous. Strombolian explosions (sometimes relatively large) from the New SE crater continued with little changes. Tremor levels show a no indication whether or not a new paroxysm is going to occur soon. A very slow rising trend is visible over the past week. A relatively large explosion has occurred some minutes ago. Volcanic tremor still doesn't show a clear trend. Very infrequent explosions (at least one) occurred during the night, and tremor has again picked up a slowly rising trend, but is far from conclusive at the moment whether and when a next paroxysm might occur. Strangely, many of the previous ones have occurred on Saturdays (as if to provide a special weekend show for the Catanese people)... An explosion around shortly past 23:08 (LT) on the picture attached was relatively strong. Guides from Etna confirmed that some of the explosions during the past days threw bombs as far as the Torre del Filosofo area. Access to the area above 2500 m is currently limited. No significant changes have occurred today. Tremor has decreased to low levels, but mild strombolian explosions continue to occur from time to time. Explosions from the New SE crater continued over night and this morning, although their frequency and size has decreased. Tremor levels have remained essentially unchanged and are still low. Intermittent strombolian explosions continue to occur every 10-15 minutes from the New SE crater. Tremor levels are fluctuating with no clear tendency (yet). Strombolian explosions have continued throughout the night and and this morning with little variations. Tremor has been rising overall, then dropped and now risen again. Judging from this, the volcano seems still "undecided" whether and when to head towards the expected 15th New SE crater paroxysm. Since about an hour ago, some relatively strong explosions re-appeared to occur at the New SE crater. This could be a signal that it is heading towards a new paroxysm in the near future. Tremor continues to rise slowly. The next days (if not hours) will probably give the answer. Seismic unrest continues and gives the general impression that "something" could be in the making at the volcano. A swarm of earthquakes at depths around 15-20 km has been going on under the SW flank, suggesting magma could be rising from deeper reservoirs into the volcano's shallower storage areas. Tremor has been showing a rising tendency, but so far, no particular eruptive activity has been observed. Tremor and surface activity have continued to decrease. Once more, Etna has surprised us, this time by NOT producing a second paroxysm shortly (few days) after the one 26 Oct (as it often did after the first such eruption in the past). The volcano has been very calm (except degassing) since the last weak ash emissions from the New SE crater observed on Sunday. However, an interesting cluster of earthquakes has been occurring during the past days. The quakes were located in two areas under the western and northern flanks at depths around 25-30 km, respectively. Whether this is a precursor to some new activity and if so, which, is impossible to say, but one might speculate that the NE rift zone has been somehow involved and could become active again. Perhaps even the ash emissions from the NE crater during the last paroxysm are related to this. Saturday's paroxysm produced (still hot) lava flows from the saddle vent between the old and new SE cone. The western branch cut the road leading from Belvedere to the 2900 m parking area, burnt the mountain guide's hut there and covered what little was left of the Torre del Filosofo for good. It then reached as far as into the valley between the 2002 crater and the Monte Frumento Supino. This was the first time, lava flows from the New SE cone went into this area.